Carl Fechner is an internet marketing guru. In the 1990s he sold four-page websites for CitySearch, which taught him how to use a computer and understand the internet very early on. Carl learned to explain the web’s benefits in a jargon-free way that business owners understood. In 2006, he began using his experience to advise other businesses on how best to sell their products online. Carl became an expert at identifying how to promote products and services in the exploding internet market. “I believe the Internet is the greatest media marketing opportunity in history that will affect every business owner on earth,” Carl says. With the help of a team of technicians, Carl helped business owners who were struggling to manage the transition from offline marketing to effective online marketing. Internet Secrets Made Easy was initially a web development and search engine optimisation business targeted largely at Baby Boomer business owners. While Carl had achieved some great results, inconsistent service delivery by parties handling the backend and technical aspects of the business was absorbing an enormous amount of time, impacting service delivery and profitability. “I recognised to be best at what I do, I needed coaching, that is coaching from others that know more than I do or know how to get the best out of me,” Carl says. After meeting SBMS mentor Bruce Hall at a workshop, Carl organised sessions with him. Bruce is a workshop facilitator who has been a mentor for 10 years, specialising in personal development, marketing and e-marketing. Carl had 12 sessions over 18 months with Bruce and mentoring is continue. Bruce discovered that Carl dealt with clients while a Philippines team handled website builds, search engine optimisation and technical elements associated with maintaining an effective online presence. “His knowledge of Search Engine Optimisation was impressive,” Bruce says. “Whilst he had been able to achieve some great results for clients, despite his best efforts the team he had built in the Philippines were not delivering the quality of support necessary. Moving from targeting “baby boomers” to emerging/established businesses in regional Victoria. Clearly defining Carl’s role within the business. Updating the website to provide a more modern look and better user experience. Revising pricing and creating specific packages of services. Establishing the website as a web and social media marketing educational resource for businesses. Building robust processes at the back-end to avoid previous problems. Using Carl’s offline sales experience as a point of difference. While most competitors may improve a site’s ranking and engagement, they don’t have Carl’s level of experience in sales and sales conversion. Reworking marketing materials, brochures, engagement letters and workshop presentations. Bruce says Carl was open to suggestions and prepared to invest the time and capital needed to place the business on a sound footing and provide clients with a quality experience. 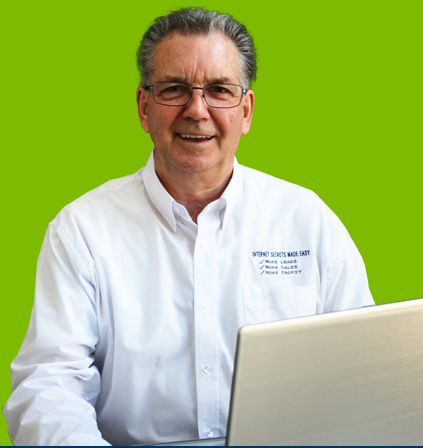 Carl travelled from Bairnsdale to Melbourne for meetings and has spent many hours updating his website, adding content and expanding his social media presence. He also worked hard to promote his services via workshops and networking throughout regional Victoria. “Carl has far greater clarity around his target market, his offer and what he should and shouldn't be doing within the business,” Bruce says. “He has also built a quality online presence – a solid foundation from which he should derive benefit over the coming year(s). Since seeing Bruce, Carl has turned a profit by running interactive digital marketing strategies workshops and coaching programs to help identify online buyers, matching messages to their needs. Now working alone, he also helps businesses source technical support and manage digital marketing strategies. Carl is thrilled with Bruce’s advice and guidance. He says Bruce was a great match due to his experience in sales and marketing and in the digital space.